At Discovery Point, children typically aged 18 through 30 months enjoy our toddler child care program. Children at this stage are typically active, learning, and busy; easily engaged and eager to explore and discover. We therefore keep our student to teacher ratio low because we understand toddlers need lots of attention. Our special toddler daycare curriculum balances independence with teacher guidance, emphasizing holistic development. This means we make every effort to incorporate opportunities for growth and learning across all spectrums: physical, cognitive, emotional, and sensory. Our goal is to help all the children in our toddler program grow and thrive while giving them the attention and supervision they require. 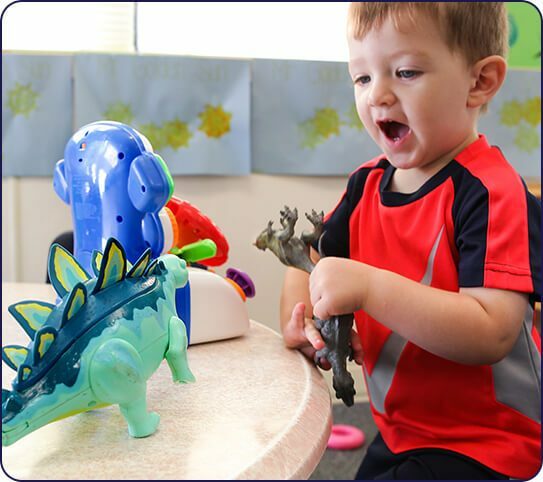 Our toddler daycare program at Discovery Point balances guidance from our skilled caregivers with increased opportunities for student independence. This helps encourage confidence in our students. Structure is important for childhood learning and development. While consistency gives children confidence, we also make sure to remain flexible, allowing children to exercise self-assertion and make choices in regard to growth and learning. The toddler classrooms are built with children of this age group in mind. We keep our floor plans bright, open, and sunny for maximum teacher visibility, so children have a safe space to explore and exercise independence while staying safe. We provide special playgrounds for infant and toddler classes, ensuring safe peer play. The toddler room is equipped with toys and materials that are carefully chosen based on our students’ developmental stage. Every child has a space for personal things and supplies from home. Parents supply baby wipes and diapers until their toddler is completely potty trained. We sanitize all toys throughout the day and wash sheets every week. Discovery Point team members are passionate about helping children of all ages reach their full potential. We welcome you to schedule a tour to learn more about our toddler child care program by finding a center near you to get started today!